Was there an ANZAC Roundel? 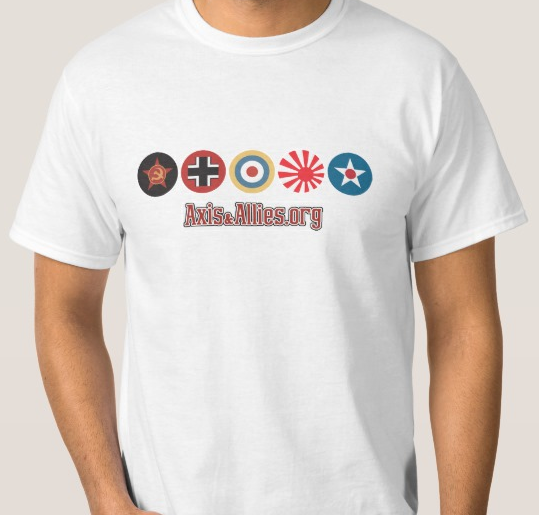 I was recently contacted by Zazzle (where the t-shirts are) that the ANZAC roundel t-shirt violated a copyright. I thought, “This is crazy, it’s a military symbol, most of which are public domain.” So I started to dig around on Google. I couldn’t find it. But that’s not the roundel. Is the ANZAC roundel in Axis & Allies original work? When the 1940 game came out, I assumed (perhaps because I didn’t really like it) that the ANZAC roundel design was just something made up…but someone on the board soon dug up its source. I can’t recall the details, but I think it’s a real design. If I can track it down I’ll post the answer here, unless someone else finds it faster. Maybe FMG knows for sure if the symbol is under copyright since they use the symbol on dice. Good catch – that’s the one I was thinking of. Thanks. 1. The basic concept of a stylized sunburst over a crown is a design that is definitely associated with the Australian armed forces (famously so, apparently), and which is called the Rising Sun. 2. The design’s association with Australia is clear-cut, but its association with New Zealand looks a lot more debatable. There may not actually be any such association officially, or the association may just be a side-effect of Australia’s and New Zealand’s participation in the ANZAC formations of WWI, whose role at Gallipoli is considered a defining event in the history of both countries. 3. The Rising Sun emblem has gone through many versions over the years, so it’s possible that no particular version can be singled out as “the” real one (as opposed to all the others), except perhaps that a particular version was the standard one at a particular period of time. 4. The Rising Sun has definitely been used as a badge, but whether it was ever used as an actual roundel (specifically an aircraft roundel) is unclear. 5. It’s quite possible that the specific artwork for what’s called the ANZAC roundel in A&A is proprietary, even though the general design of the Rising Sun badge has been around in many forms for a long time. HBG makes the ANZAC roundel though in wood or fiber board. "Originally, the air force used the existing red, white and blue roundel of the Royal Air Force. However, during the Second World War the inner red circle, which was visually similar to the Japanese Hinomaru, was removed after a No. 11 Squadron Catalina was mistaken for a Japanese aircraft by a US Navy Wildcat in the Pacific Theatre. After the war, a range of options for the RAAF roundel were proposed, including the Southern Cross, a boomerang, a sprig of wattle, and the red kangaroo. On 2 July 1956, the current version of the roundel was formally adopted. This consists of a white inner circle with a red kangaroo surrounded by a royal blue circle. The kangaroo faces left, except when used on aircraft or vehicles, when the kangaroo should always face in the direction of travel. Low visibility versions of the roundel exist, with the white omitted and the red and blue replaced with light or dark grey." Okay, so the answer to this question is no but a copyright claim might be dubious given that it is an amalgamation of existing government symbols. I hate to break this to you but the term ANZAC actually doesn’t apply to WWII era Australia and New Zealand. It goes for the term in WWI, however to somewhat contradict this statement; there was an ANZAC corp giving by the UK to a combine unit in Greece. So it did exist in small numbers but as far as the strategic use of it, Australia and New Zealand never combined their arms into one military in WWII. With that said, I don’t think you can find an ANZAC roundel for WWII as I am guessing each nation would use whatever their roundel would be. Hi Ike. Territory has to be worth 3, yes. Also, in 2nd Edition rules, only the original owner can make a Major on a territory worth 3 or more. So they couldn’t, no. Gallipoli is also an excellent Mel Gibson movie before Mel Gibson went nutso. Great movie about a terrible operation. I blame Churchill. Yes, I’d let them remain Dutch too. One of the points of this house rule idea is to give the Dutch their own units, to rectify their rather odd status of having their own map roundel but no actual combat forces – so if the Dutch units were converted into plain old UK or ANZAC units when one of those countries lands in the DEI, it would spoil the fun. And from a historical point of view, it’s likewise accurate to keep them Dutch: the Dutch components of ABDACOM remained Dutch during the DEI campaign, even though they were part of a coalition. I also agree that the Dutch infantry units should gallantly fight and die where they stand. As Marshall Mac Mahon famously said at Sevastopol in 1855, “Jâ€y suis, jâ€y reste!” – here I am and here I will stay. Hitting Turkey turns all true neutrals pro-Allies. Not sure if it is worth it when the allies are already making SO MUCH MORE per round than the Axis. Not saying it is not worth it, just wondering if it wouldn’t be better to go around via transport instead, since it also secures the med and n. Africa.